Willowbrook - OPEN SPLIT BEDROOM FLOOR PLAN *ADDITIONAL PARKING ON REAR OF LOT *GRANITE TOPS AND BAR IN KITCHEN *HARDWOOD FLOORING *HIS AND HER SINKS PLUS TUB/SEPARATE SHOWER IN MASTER SUITE *HOA Dues cover the Exterior, Roof, Yard, Insurance on Home, and much more ! MLS#2246788. 1197. Bristol - Beautiful 4 Bedroom with option of very spacious 4th Bedroom to be a Bonus Room, 2.5 Baths, Granite Counter Tops, Center Kitchen Island, Tile Backsplash, Fireplace in Family Room, Separate Shower and Garden Tub, 2 Car Garage, Private Community Pool. Home Warranty included. MLS#2246678. 1127. Riverwood Athletic Club - Community amenities include athletic club, pools & golf! MLS#2246885. 636. Albany Acres - Upgraded features include fresh interior paint and a new roof. MLS#2246944. 4823. Seller is also building a new construction home on the adjoining lot. MLS#2246959. 4993. Flowers Plantation - Nestled behind the gated entrance in our 55+ Active adult community. MLS#2246482. 2515. Generous Bonus Rooms lends itself to endless possibilities! MLS#2246409. 1197. Pools, gyms & golf w/ your FSC Membership! MLS#2246405. 1197. This amazing community offers walking trails as well as pools, gyms and golf with your FSC membership! MLS#2246403. 1197. Enjoy pools, gyms and golf with your FSC Membership! MLS#2246407. 1197. Enjoy gyms, pools & golf with your FSC Membership! MLS#2246397. 1197. Bristol - 2" blinds throughout home. Community pool and playground. MLS#2246340. 5019. Lassiter Farms - Close to I-40/42. NO HOA FEES! MLS#2246588. 633. Summerset Place - Screened porch overlooks woods.Driveway has an extra parking pad off to the side.Unfinished attic space has potential. MLS#2246456. 1854. Lions Gate - $2,000 Cash Allowance to be put toward closing costs or buyer-expenses! MLS#2246154. 1127. South Plantation - This Clayton one-story home offers a front porch, stainless steel appliances, master bathroom with sitting vanity, and covered backyard deck. MLS#2246496. 4823. South Plantation - Sold As Is-Motivated sellers-recent appraisal done-bring all offers MLS#2246447. 3770. Glen Laurel - Enjoy the wooded flat lot from a beautiful deck, the nearby walking trails, parks and golf course/pool community. MLS#2243223. 1320. Lee Forest - Cul-de-sac lot, Minutes from White Oak Shopping center, Fantastic location! ! 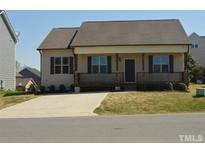 MLS#2246039. 3798. This is a new floor plan! Blinds are included as well. MLS#2246261. 1886. City Hall Is A Block Away! MLS#2246302. 1502. Edinburg - Need to grow? this home is for you! 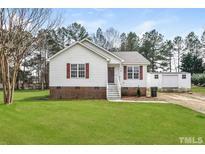 MLS#2246192. 3199. Pools, gyms & golf with your FSC Membership! MLS#2246247. 1197. Lockwood Forest - Seller offering $3,000 in a Flooring Allowance or Closing Cost! MLS#2246095. 2611.